Rise Against is an American punk rock band from Chicago, Illinois, formed in 1999. 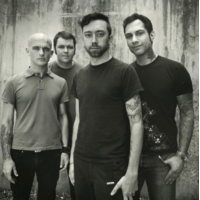 The band currently consists of Tim McIlrath (lead vocals, rhythm guitar), Zach Blair (lead guitar, backing vocals), Joe Principe (bass guitar, backing vocals) and Brandon Barnes (drums, percussion). Rise Against spent its first five years signed to the independent record label Fat Wreck Chords, on which it released two studio albums, The Unraveling (2001) and Revolutions per Minute (2003). Both the albums met with considerable underground success and in 2003, the band signed onto the major label, Geffen. The band's major label debut Siren Song of the Counter Culture brought the band mainstream success, producing several successful singles. The band's fourth studio album, The Sufferer & the Witness debuted at number ten on the Billboard 200 chart and received positive reviews from critics. The band's fifth studio album Appeal to Reason was released on October 7, 2008 and debuted at number three on the Billboard 200 chart. All three albums released via Geffen were certified platinum in Canada and gold in the United States. The band actively promotes animal rights and are all straight edge (excluding Barnes), PETA supporters and vegetarians. Rise Against recently recorded its sixth studio album Endgame at The Blasting Room in Fort Collins, due for release in March 2011.